The St Edmundsbury Sailing and Canoeing Association were pleased to host the Bury St Edmunds’ Volunteer Police Cadets for a sailing taster session at Lackford Lake, on Saturday. Unfortunately there was very little breeze but the thirteen Cadets still managed to have fun out on the water doing man overboard and capsize drills. All were competently helming by the end of the afternoon. 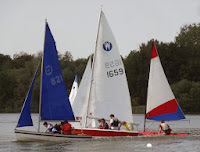 On Sunday, the Club held racing for the Singlehanders’ Trophy and a continuation of the Holiday Series. The winds were again light and shifty, which kept everyone on their toes. In the first race, Jon Holmefjord, sailing a Laser, managed to slip away from the fleet on the first lap but was eventually caught by Kieron Adams and Mike Steele sailing the other two Lasers. The Lasers held their positions on corrected time, as the rest of the fleet was caught in a dying breeze. In the second race, Jon Holmefjord got away again and on this occasion managed to hold onto first place, despite being hard pressed by Kieron Adams. The slower boats, particularly Chris Seear*, Streaker, and Chris Style, Comet, which had looked to have been performing well in the first part of the race, were again disadvantaged by the light breeze resulting in the Lasers staying at the top of the scoreboard. The wind had picked up a little for the third and final race. Unfortunately, Jon Holmefjord wasn’t able to sail but Ellis Blackmore switched out of his Topper into a Club Laser to give Kieron Adams some more competition. The fleet was also bolstered by Graham Newton and family racing their GP 14 for the first time. Kieron Adams ended up winning again, which earned him the Singlehander’s Trophy, but was hard pressed around the course by Ellis Blackmore – a very creditable performance considering it was the first time that he had sailed a Laser.